NEW EDITION COMING SOON. This book is the outgrowth of a course taught to residents in radiation oncology at Wayne State University, at the suggestion of residents who saw a need for a technically accurate text set at the correct mathematical level. It is intended to be a book to learn from, not a comprehensive compendium. 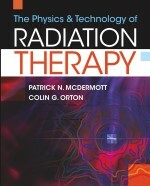 It is written for members of the radiation therapy community such as radiation therapy technologists, dosimetrists, and radiation oncologists who may have taken college physics several years previously but still need to know the basic physics of radiation therapy. For graduate students in medical physics, it will serve as a review of the "basics." The material is written to be relevant to clinical practice, without covering specifics in treatment planning, and also with a close eye on board certification requirements.